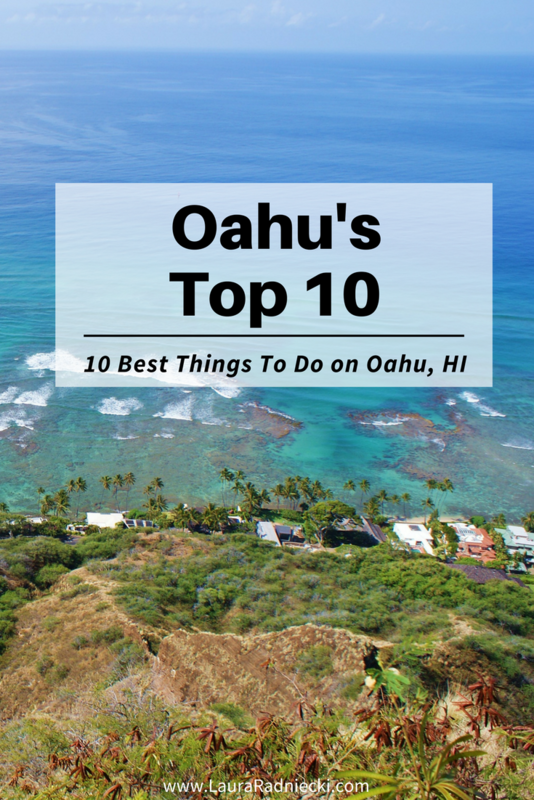 A list of the Top 10 Best Things To Do on Oahu, Hawaii. 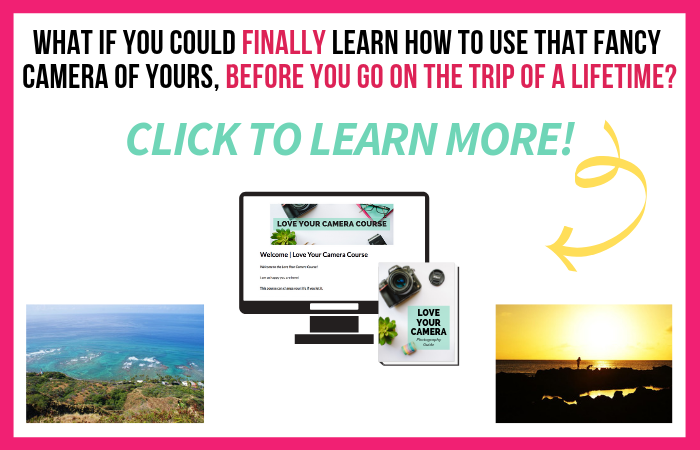 A must read if you’re planning a trip to Hawaii, and want to know all of the best Oahu secrets, activities and tips! Since living on Oahu, Hawaii for 9 glorious months in 2009, I’ve been asked countless times for activity recommendations by people who are heading to the islands on vacation. 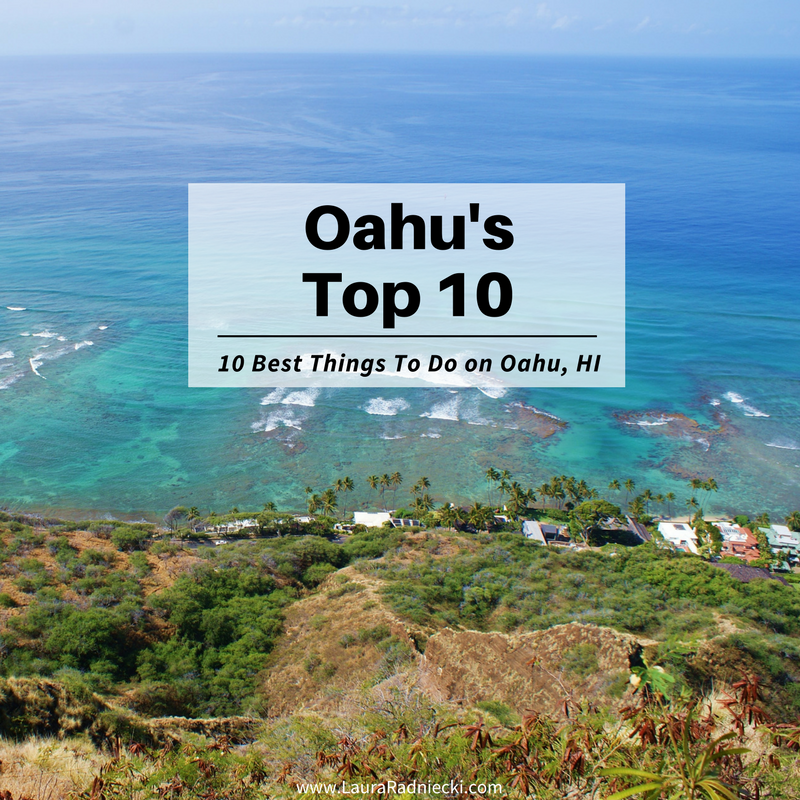 I thought it would make a good FAQ post to list out our top 10 favorite things to do on Oahu, Hawaii, for anyone who is dreaming of Oahu, or who is heading to there on vacation and looking for things to do or see. Please keep in mind that these are the best, in our humble opinion alone, and that there are many other incredible things to do and see on the island besides these. The list I made of our favorites was much longer than 10 so I pared it down to include our MOST favorite. I might need to do a follow-up post to this one in the future. I know other people will disagree with this list, saying other things are better than what I’ve listed, but like I said, these are in our opinion only. 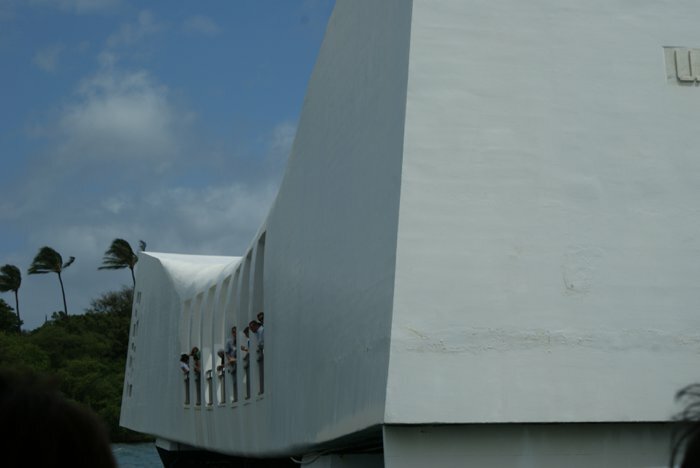 I listed Pearl Harbor first because it was such a moving place for me to visit. We went with each different family group that came out, and I enjoyed the experience every time. 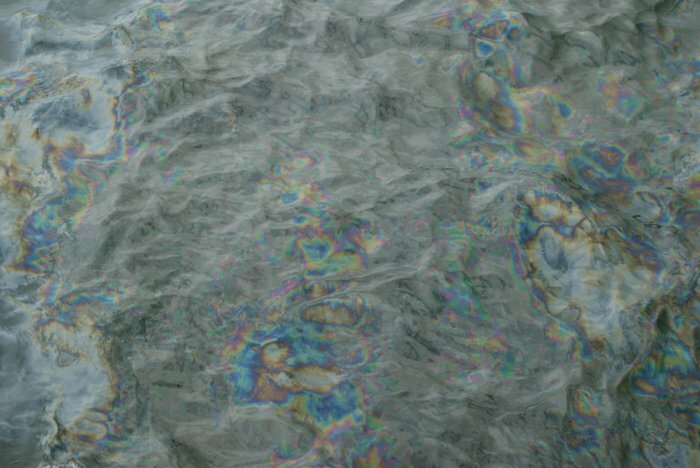 Hearing the stories, watching the video from the day Pearl Harbor was attacked, walking through the memorial and seeing the oil still leaking up in the bay; it got me every time. The iconic Waikiki Beach is a must see when you’re on Oahu. If you’re visiting, chances are you might be staying in Waikiki, since the majority of the island’s hotels are located here. 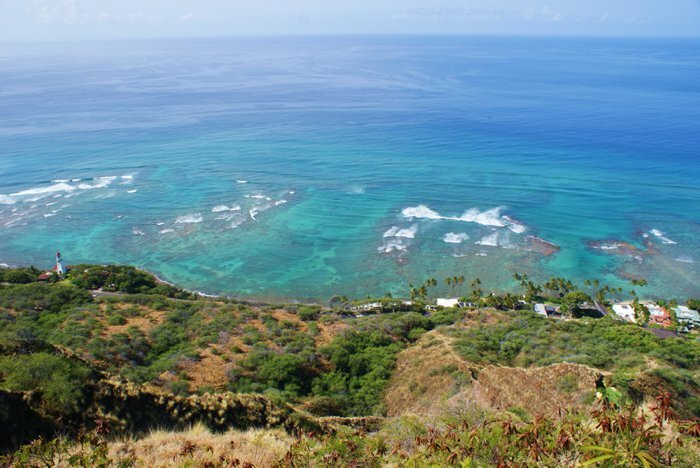 During the day, the view of Diamond Head [top photo, below] is spectacular, and the beaches are idyllic. The water is warm, you can people-watch to your heart’s content, and there are lots of water activities to try. 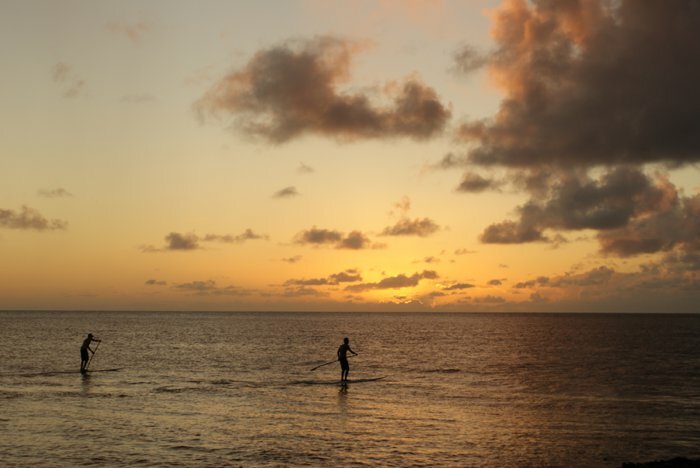 You can learn to surf, snorkel, hop on a fishing charter, try out a dinner cruise, or stop at one of the many bars and restaurants along the beach. At night, the Waikiki strip is full of night life, shops and more attractions to keep you entertained. Diamond Head is actually a state monument, and it’s as much an iconic part of Oahu as Waikiki Beach. The hike up Diamond Head is easy enough to accommodate most anyone; I saw girls making the trek in high heels! The views from the top are nothing short of jaw-dropping. One of my most favorite photographs I’ve ever taken is from the top of Diamond Head and hangs as a huge canvas in both my bedroom and my parent’s bedroom. A hike similar to Diamond Head but less commercialized and organized is the Makapu’u Point Lighthouse Trail. 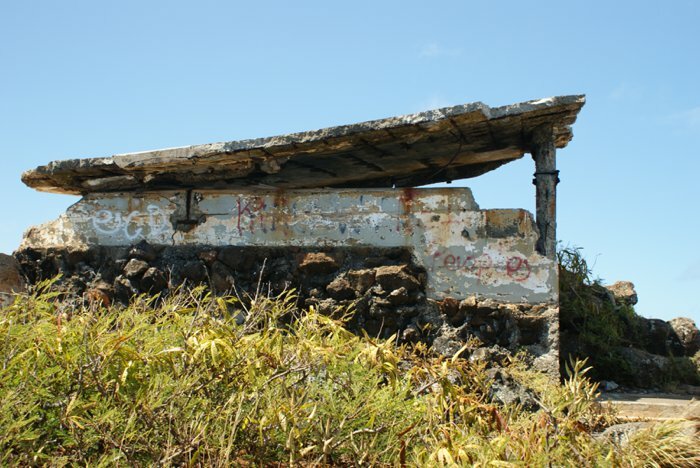 This hike provides more incredible views and other neat sights along the way like old military bunkers and a beautiful lighthouse. 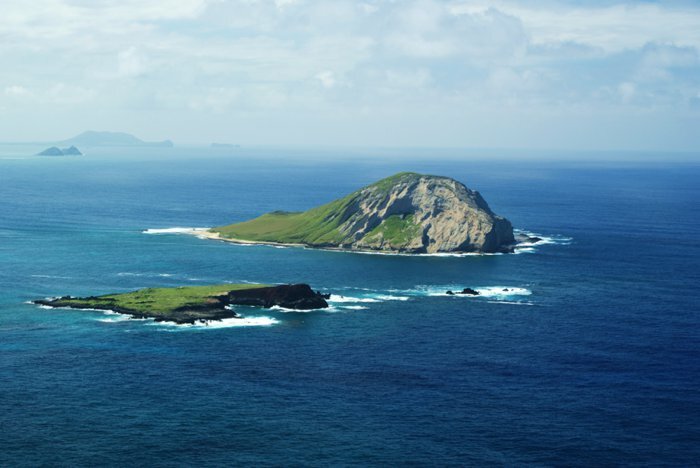 In the photo below, the little turtle-looking island on the horizon to the left? That was where we called home – Marine Corps Base Hawaii [MCBH]. Matt lived there for 3 years, when he wasn’t deployed to Iraq, and I lived there for 9 blessed months in 2009. I love to snorkel. I love snorkeling in Minnesota’s lakes and mine pits, even though the fish we see are all generally the same color and look a lot alike. Snorkeling in a tropical place is completely different and totally charming. 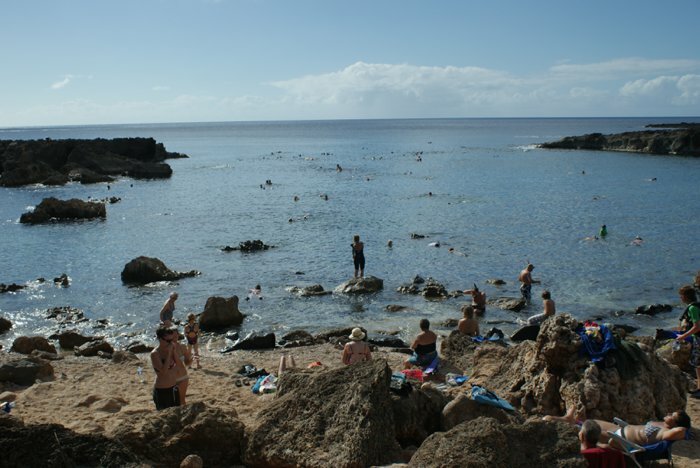 There are two amazing places we liked to snorkel and we took our visitors to. 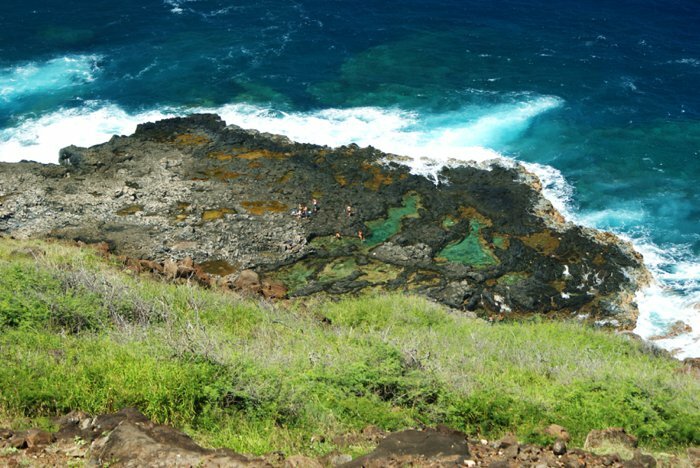 Shark’s Cove is a great spot off the Kamehameha Highway. You park along the road, walk down to the bottom of the cove’s shoreline and jump in the water. If it’s wavy that day or the tide gets too high, there can be rolling waves which stir up the bottom and make it hard to see the fish. But it’s a great spot to snorkel and there were TONS of fish to see every time we went there! 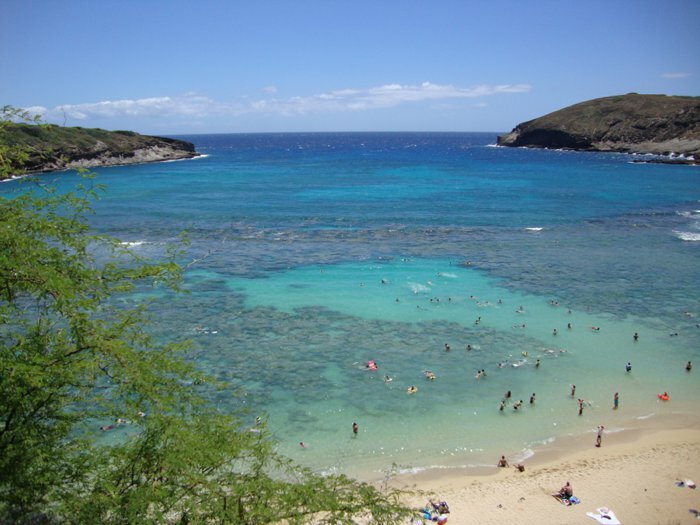 Hanauma Bay is another incredible snorkeling place. It’s very popular, and the parking lot fills up quickly. So if you plan to go, go early in the day so you can get a spot. You have to pay, but it’s well worth the money. There are tons of fish, and the bay is so picturesque you could almost cry. My only complaint about snorkeling here was that we must have gone at a low tide time. The water was only a few feet deep, so I was almost scraping the bottom at times as I swam along. It might be worth trying to go at a time of high tide here, or else just deal with it. It did allow me to get real up close and personal with the fish! We lived at MCBH which is on the windward side of Oahu. Waikiki and Diamond Head are on the south side. Not far from the base was the prettiest botanical garden I have ever been to. 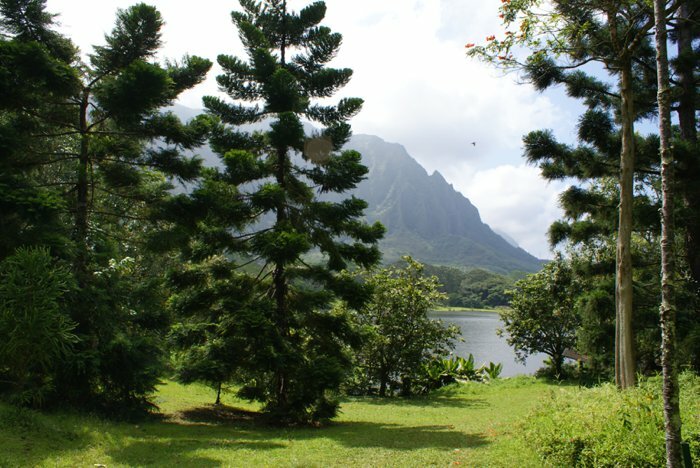 The Hoomaluhia Botanical Gardens in Kaneohe were absolutely spectacular and made you feel like you were very much in lush, jungle Hawaii. 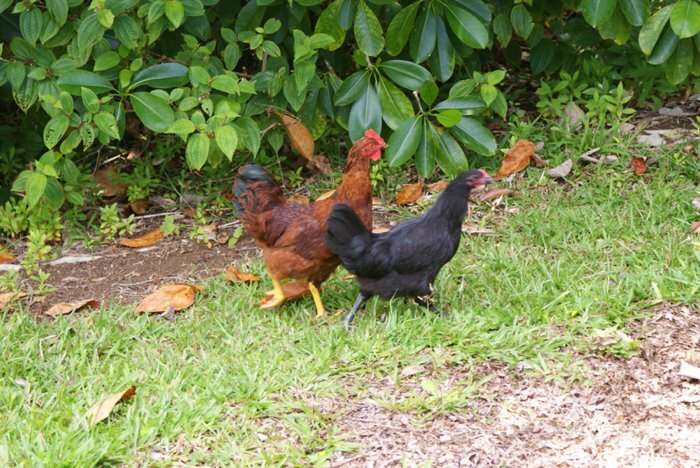 Chickens ran wild through the gardens, there were dozens of hiking trails, and the views… oh the views! One thing I would recommend is bringing some bug spray. We didn’t and were driven out of some spots because of the bugs. On one of my very first trips to visit Matt before I moved out for good, he took me to Maunawili Falls, on a hiking trail through the jungle of Oahu. 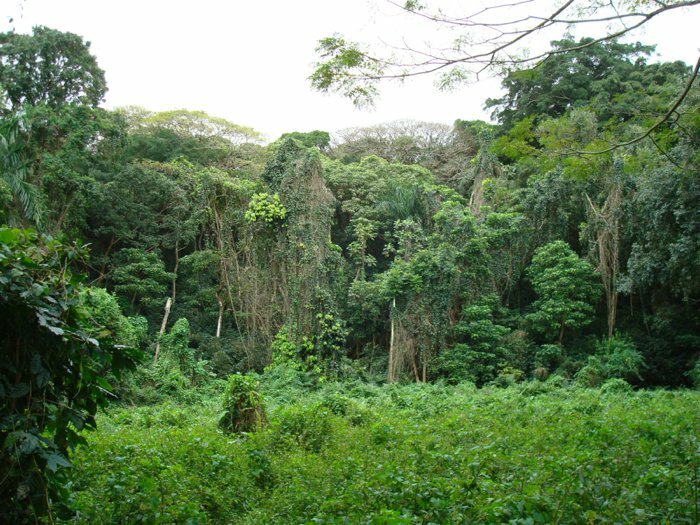 I loved the feel of being deep in the lush vegetation of the jungle, and it was unlike anything I’d ever seen before in my life. It made such a great impression, we brought every visitor we had there too! The hike is on a trail through the jungle, over a few streams, and finally leads you to a breathtaking waterfall. Maunawili Falls is notorious for being a place where people can jump off that rock ledge, into the pool below. There is also a much higher ledge to the top left of the photo, maybe 40 or 50 feet above the pool? I’ve seen people jump from there too. I passed on that opportunity. Maunawili Falls remains one of the key memories that pop into my mind when I think of Oahu, and being in Hawaii. It is very much what I picture as HAWAII. We stumbled upon this beach on our drive up the North Shore once, but I know it’s not a secret beach by any means. We had just never heard of it before. As you’re driving up the North Shore toward Haleiwa, just before you get to the town of Haleiwa, you’ll pass a beach that will be full of cars. 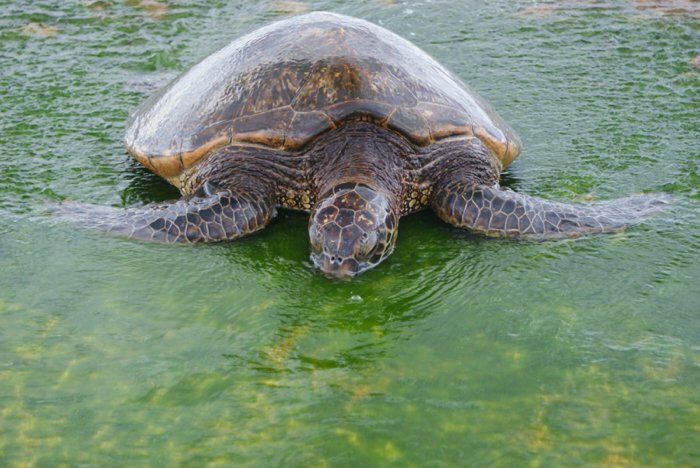 That beach is Laniakea, better knows at Turtle Beach. Turtles come in to eat the algae on the rocks and they are mesmerizing. You can see them floating in the waves in the shallow parts of the water, and then you can almost always see some up on the shore. When my parents talk about being in Hawaii, Turtle Beach is one of their most favorite memories. They liked it so much that we went back twice during their visit. One of my favorite things to do while we lived on Oahu was to get in our car and drive around the island. 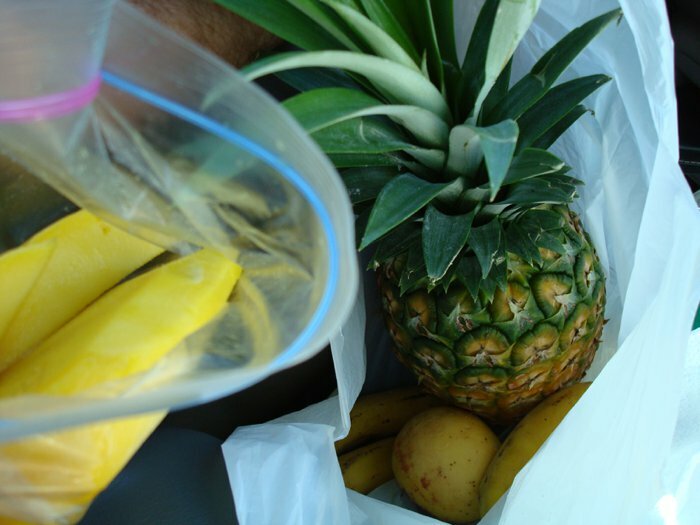 You can drive around the perimeter of most of the island, cutting through the middle which offers you views of picturesque pineapple fields and the Dole Plantation. 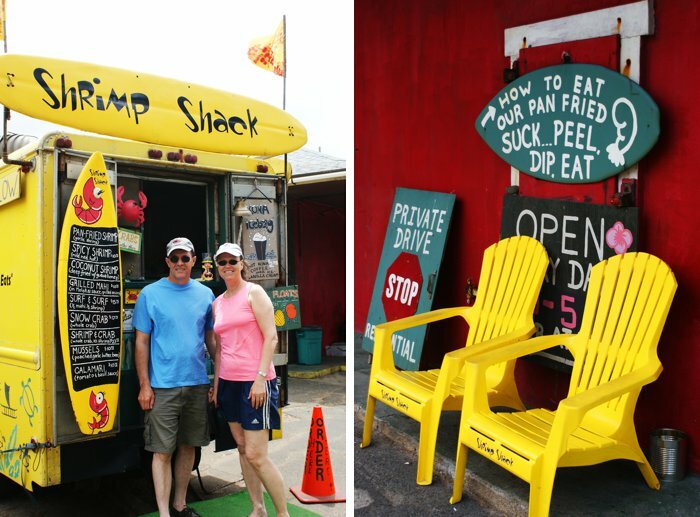 Some of the must-sees on a drive around the island are the views everywhere, the delicious fruit stands that dot the edges of the highway, the Shrimp Trucks and Shacks along the way, and when you get to Haleiwa, getting Shave Ice at Matsumoto’s or Aoki’s. 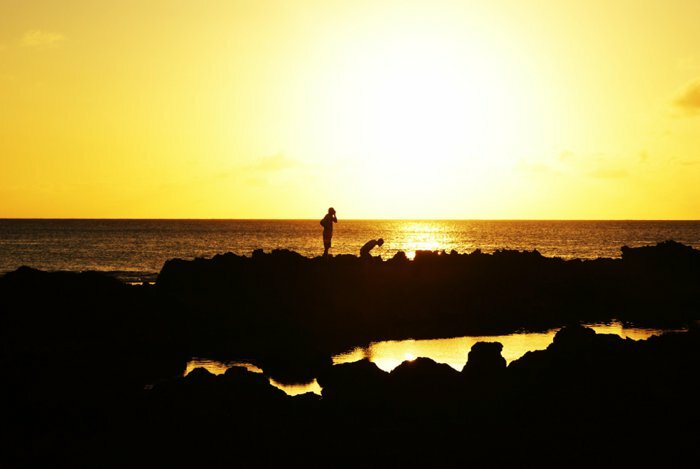 Catching a sunset while sitting on the beach on North Shore is an incredible way to experience Hawaii too. 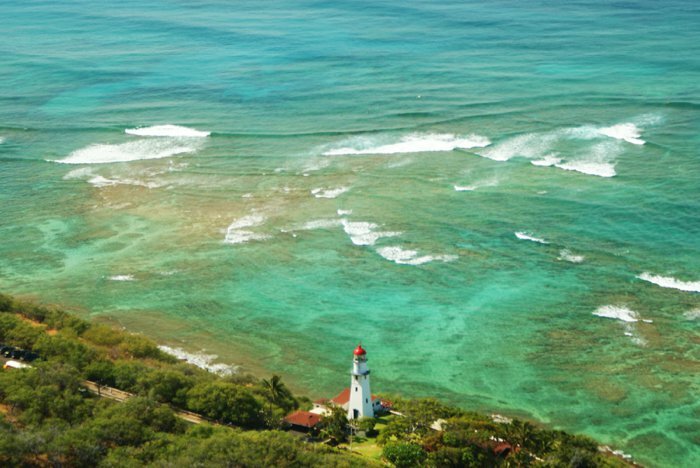 The last of our favorite spots on Oahu is on the far southwest side of the island. The majority of everything else is either on the southern part of the island, the eastern side or the north shore. 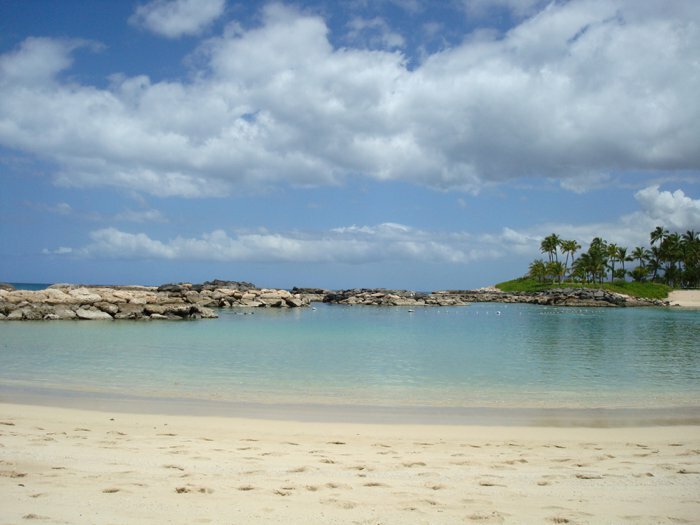 On the southwest coast of Oahu are the Ko’Olina Lagoons. They are incredible beaches with the finest white sand and the calmest waters, because the reefs block the waves. I felt like a mermaid sitting on the beach at Ko’Olina! The only downside to these lagoons is that parking can be a problem. We lived on the opposite side of the island and one time, we drove ALL the way across the island to go to the lagoons. Once we arrived, we found the parking lots completely full and had to change plans and go someplace else. If you go, get there early so you can secure your spot. 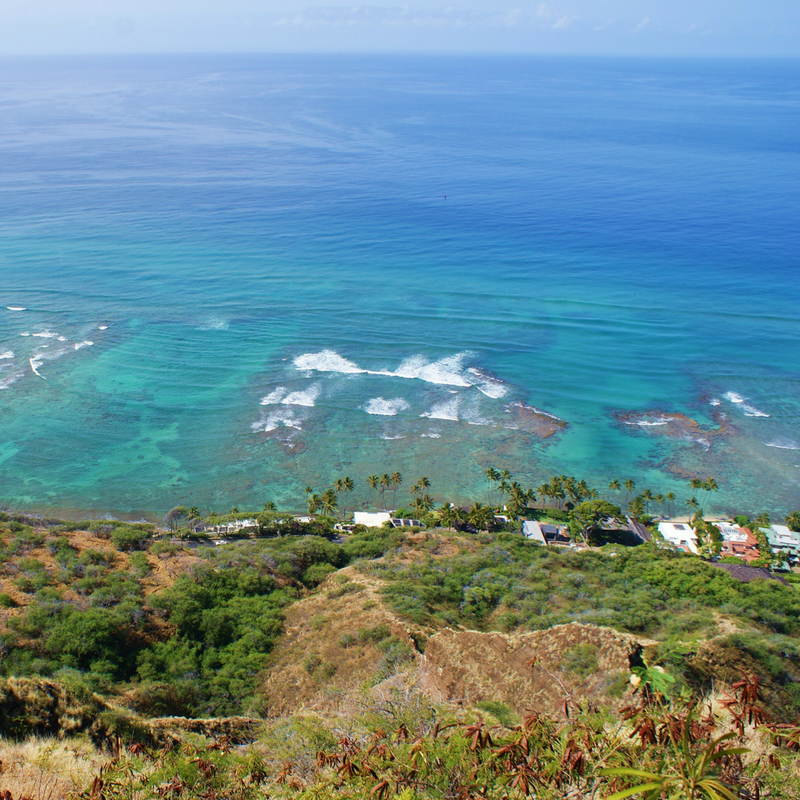 There you have it – our Top 10 Favorite Things To Do On Oahu, Hawaii! Like I mentioned before, there are many, many more things to do on this incredible island. I would highly recommend picking up a guide book to help you plan your trip. 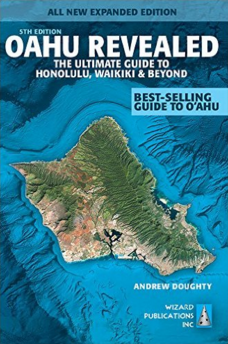 A good Oahu, Hawaii guide book will point you to hidden gems that you might not find out about otherwise, as well as give you food recommendations that can be very helpful. I bought and read Oahu Revealed cover to cover before our trip and it helped find many Must Do’s we would have missed otherwise. Things change quickly too, so it’s possible some of these recommendations will change over time. One of my favorite things to do in Waikiki was to go to the International Marketplace, and while I was writing this list, I googled it and discovered that just a few months ago, the International Marketplace closed and was torn down to accommodate a Saks Fifth Avenue. How disappointing! However, a blog reader who lives on Oahu mentioned that many of the vendors from the International Marketplace relocated to the Swap Meet at the Aloha Stadium. The hours vary to be sure to check first before you go. But that’s a great place to look for souvenirs. I also read that the Aoki’s building that had been serving Shave Ice to locals and tourists alike for decades was torn down in part of a new development project. Aoki’s said they were moving to a new building, so I hope they continue to have business success in their new location. Matt and I are starting to plan our return to Oahu for the first time since leaving in September of 2009. I can’t wait to revisit these favorites of ours and soak in the Aloha spirit we have missed so much. The islands get into your blood almost the minute you set foot here, and you never get rid of that feeling. At least we didn’t. Have you been to Hawaii? Oahu, or one of the other islands? What were your favorite things to do? P.S. There have been other great suggestions given in the comments section below. 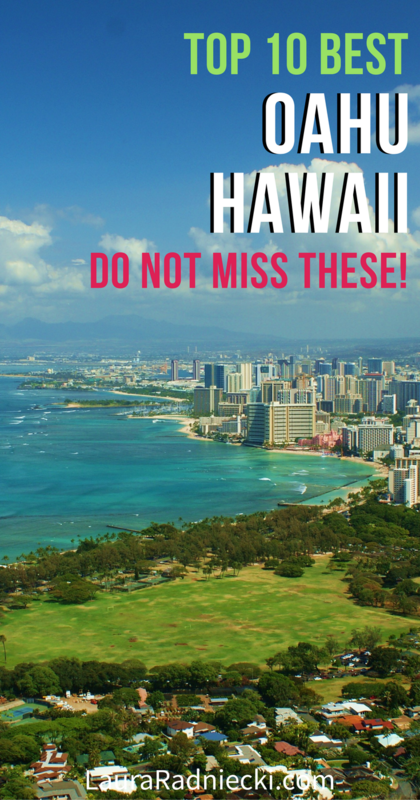 Make sure to give those a look to add a few more things you must do on Oahu Hawaii! Remy Became a Radniecki One Year Ago Today! I love this post! We’ve been here just under 5 months, and so far, a few places that you listed have been our favorite! We love the North Shore, because it’s closer to Schofield, and in my opinion, a nicer place to hang out than Waikiki. I agree! While I think Waikiki is fun and a definitely place to go once in awhile, I much prefer a quieter beach and less tourists, so that’s why North Shore was so fun for me! 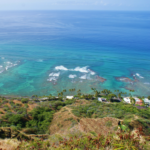 How long will you be on Oahu for? Isn’t it the greatest?!? I can’t wait to go back in less than a year after being gone almost 5 years! Aloha Alex! I completely agree! The North Shore is such a breath of fresh air compared to Waikiki. However, if you ever have family or friends visiting, or want a night out in the “city”, there is a new show opening in Waikiki this month! It’s is called MYTH, Hidden Legends of Old Hawai’i, and it isn’t your typical luau. It is a culturally-based Hawaiian and Polynesian production that prides itself on bringing authentic hula and local entertainment to the heart of Waikiki. In my opinion, another breath of fresh air. 🙂 Check out http://www.mythhiddenlegends.com if you want to know more! Mahalo! We went to Oahu for my birthday, Christmas and New Year. We decided that, on Christmas day, we would go to the Polynesian Centre to a luau only to be told that it was closed and we ended up going to Germaine’s (I think that was the name). While it was OK I thought it was a bit over-priced and as there was over 800 people there a quite busy. I have heard of Germaine’s Luau. We went to one but I’m not sure what it was called. We went to it on a night designated just for Matt’s military unit, so it was less busy than that. But I agree, 800 people there would be very busy and less of the ‘Hawaiian luau’ experience you would hope for. But maybe still worth the experience once? I’m happy to hear the suggestions were helpful and that you had a great time! Thank you for sharing! We are so excited to go to Oahu in April 2015 to celebrate our 25th wedding anniversary! Thank you for reading; I’m glad you enjoyed it! Oh wow, there is no better place to celebrate 25 years of marriage than on Oahu!! I’m so excited for you to explore the island! Thanks for the suggestions I am heading there in Jan for my Birthday I will do Maui and The big Island as well! I really want too se Diamond Head! Oh, you will LOVE your birthday trip!! I hope you’re able to hike to the top of Diamond Head and get a glimpse of Waikiki beach and the ocean below. It’ll be something you’ll never, ever forget! Contina! How was your trip?? We are going one week from Friday. Can’t wait! How sad that the markets are gone. Lordy do we really need Sacks on Waikiki?? My granddaughter and I are coming to Hawaii in April 2015 and I was so looking forward to going to the markets with her. I hope you and your granddaughter have a great time on your trip; what a great bonding time! I live on Oahu and many of the vendors from the International Marketplace moved to the Swap Meet at Aloha Stadium. They have goofy hours so be sure to check before you go, but it is a great place to get cheap souvenirs. And don’t buy the first thing you see! Chances are, someone else has it for less 4 or 5 booths down. What a fantastic way to celebrate your 50th birthday, as well as Christmas and New Years!! I hope that you enjoyed/are enjoying your trip and that you get to fully experience all Oahu has to offer!! My boyfriend lives in Oahu (by the Aloha Towers), and I have been fortunate enough to have been there 3 times. The North Shore is my favorite. Lots of great restaurants in Honolulu … some within walking distance of high rise. Lots of genuine ethnic food. Thanks for covering the main spots to visit. Yes, no place quite like belle HI! Lucky you to have a great reason to visit so often!! I agree with North Shore being my favorite too. Such a blessed, beautiful island. We are planning a trip to Oahu soon and found your site. 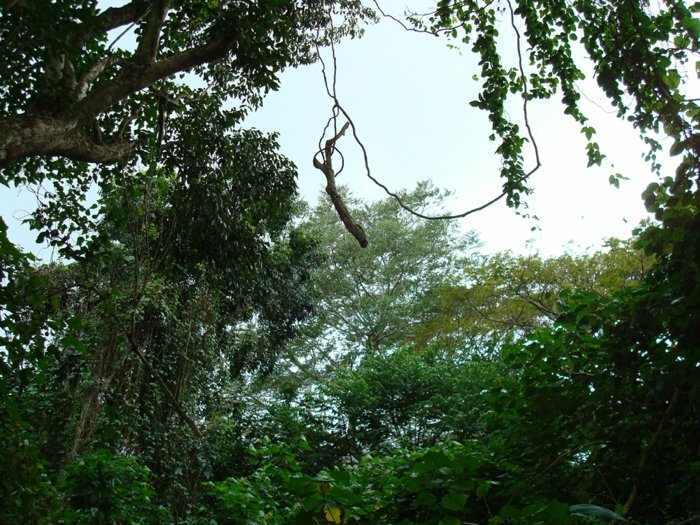 I was wondering about the trek to Maunawili Falls. Is it something that can be done with a 3 year old? I recognized the waterfall from my favorite Jason Mraz video and would love to see it in person but of course I wouldn’t want to do something that wouldn’t be too safe for my little one. 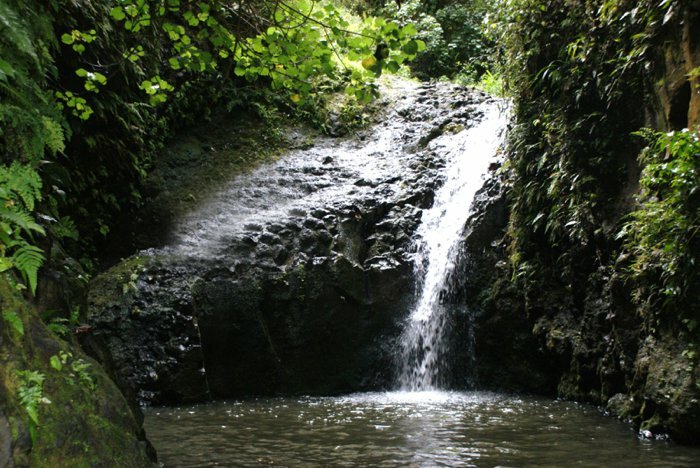 Don’t go with elderly or small children to the Maunawili Falls in late December. Absolutely full of mud and very slippery. It’s up and down hills with roots, ankle deep mud in many places. Go to Teddy’s Bigger Burger for the best hamburger you’ll ever have!! It was one of my favorite places when I lived there. Thanks for the addition to the list, Lisa! I never made it to Teddy’s, but I’ll make sure I do when I return for another visit! I enjoyed your blog about Oahu, but kept waiting for the premier attraction so tourists can get a taste of all of Polynesia – and that’s the Polynesian Cultural Center. I went to college next door, in Laie, and think it’s a must-see event! We spent a whole lot of time at many of the places you mentioned, particularly Haunauma Bay, a real favorite. Ask about the Toilet Bowl when you go. I also enjoyed your blog because you mentioned two places I had not visited yet. I look forward to going to those next time. Thanks for reading and commenting! Lucky you to have had the chance to go to college on Oahu!!! I love Laie. We stopped there many times on drives around the island. I appreciate your comment and input!! We went in September twice ’98 & ’99. Stayed at the Waikiki Circle Hotel. It is just far enough down the way, yet close enough to walk to the main area. The parade and the block party was just below our balcony and we could see from the pink hotel to Diamond Head from our balcony. We took the tours. The bus tour around the island was great. If you rent a car or moped you’ll drive by things and either not see them or see them and not know what you have seen. Ala Moana Shopping Mall was very interesting. Matt and I caught a block party once and that was fantastic!! Your spot at the Waikiki Circle Hotel sounds awesome. I have never heard of that hotel before. Thanks for your extra input on the bus tour and the Ala Moana mall! We loved to visit the mall when we went into Honolulu. Thanks for the awesome website, ive been to Oahu once before when i was younger and am now planning to bring the family in June from Sydney, we will be hiring a car so we can experience all that you have listed at our own pace and not be at the mercy of tour times. 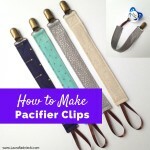 I’m happy this post was of help to you! 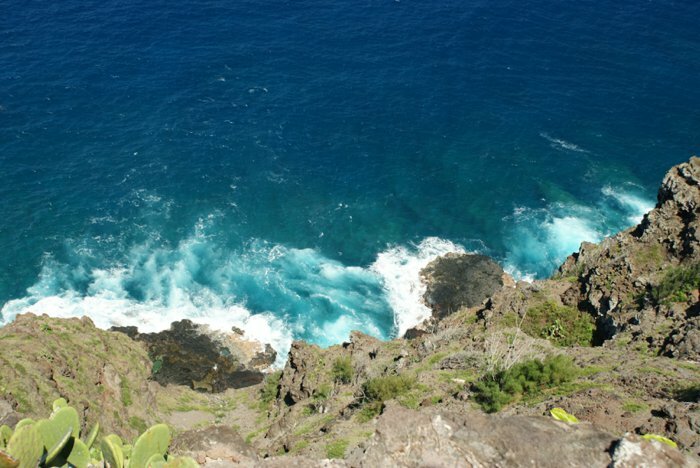 I think renting a car is a great idea and will give you flexibility to see the parts of the island at your own pace. Laura, what a great post…I’m so glad I found it! My husband and I are coming this summer with our four kids (teens/pre-teens) to celebrate our 20th anniversary, and you have given us some great ideas for places to visit on our trip! I’m wondering if you know of any good (not “commercial”) luaus we could look into? Any suggestions are appreciated! Thank you so much for reading and commenting!! What a memorable trip you’re in for – and a great way to celebrate your 20th anniversary as a family!!! Matt and I did go to a luau once, but I’ll be honest – I can’t remember the name of it. I will say that I think all luaus will be very full and commercialized. They’re such a “Hawaiian” thing to do so they really pack them full because so many people want to go. I do know that there is one called Germaine’s Luau, but it’s very populated with people. You might want to check out the Polynesian Cultural Center and see if they offer a luau? Good luck and if you find a really great luau, I’d love to hear about it so I can pass it on to others like you who ask! thank you for his awesome list! We are also celebrating our 25th anniversary in April of 2015 by going to Oahu, Maui and the Big Island – can’t wait! I am glad to see a few of the things I want to do made your list. I also think I will add snorkeling to my list. It was on the “maybe list” but the pictures of fish we may see makes me really want to try. Thanks for reading and commenting! I’m so excited you get to go explore the islands. What a fantastic way to celebrate your 25th anniversary!!! YES, I highly, highly recommend going snorkeling. It’s one of my favorite things to do. I think you’ll be happy you did it! It all looks great, but Diamond Head and Turtle Beach look particularly amazing to me! I’ve booked my tickets and I’ll be heading to Hawaii in May. I seriously can’t wait! Thanks for the great tips. Thanks for reading and commenting, I’m happy you found the post helpful! You will have an amazing time! 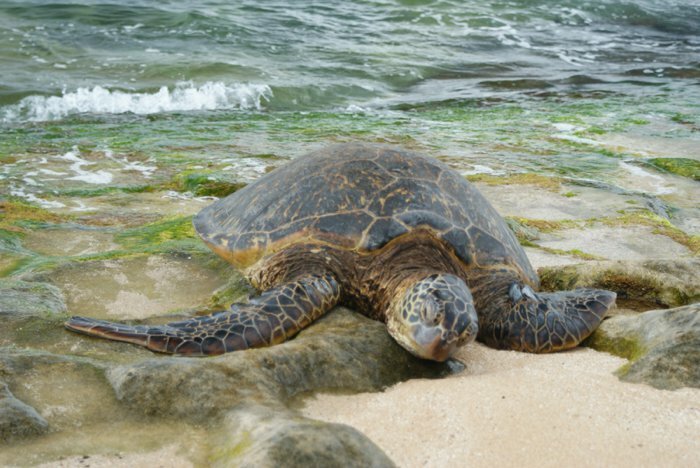 I hope you’re able to have a beautiful Diamond Head hike and see lots of turtles at Turtle Beach. Safe travels and Aloha to you! This website has been very useful to me. My husband and I will be visiting four of the islands the end of April to celebrate our 40th anniversary. So much to see in so few days. Need to hit the highlights. Thank you for reading and commenting! I’m so happy this post was helpful to you. Oh, you’re in for a treat! What a blessing to be able to see FOUR of the islands in one trip! You’re right; there is SO much to see. You could easily spend months on each island, seeing everything. I hope you enjoy every single minute of your trip, hitting all the highlights! Thank you for taking the time to write this. I’ve never seen a bad picture from Diamond Head and this just makes me want to see it in person even more. Thank you, Drew! I’m glad it helped you get even more excited to see it in person!! Don’t forget Leonard’s Bakery at 933 Kapahulu Ave, for great homemade malasadas (portuguese donuts)! They are worth standing in line for! But beware: too many, and you won’t fit in your bikini! Thank you for the addition to the list, Laurie! I’m not positive if I made it to that bakery; I think I might have because I remember some amazing, mouthwatering donuts haha! You’re right – too many and it’d be a one-piece beach day for sure! 🙂 Thanks for reading and commenting! I appreciate it! 1. Iolani Palace, the only real royal palace in all of the US! 2. Bishop Museum. An amazing collection of artifacts depicting old Hawai’i as well as history of the ali’i, musical implements, feathered capes and headdresses, kahili, ancient cooking utensils, and on and on. 3. Sea Life Park which features a beautiful island girl who swims with dolphins, a huge saltwater aquarium, a show featuring tricks by dolphins, porpoises, whales, and penguins. 4. 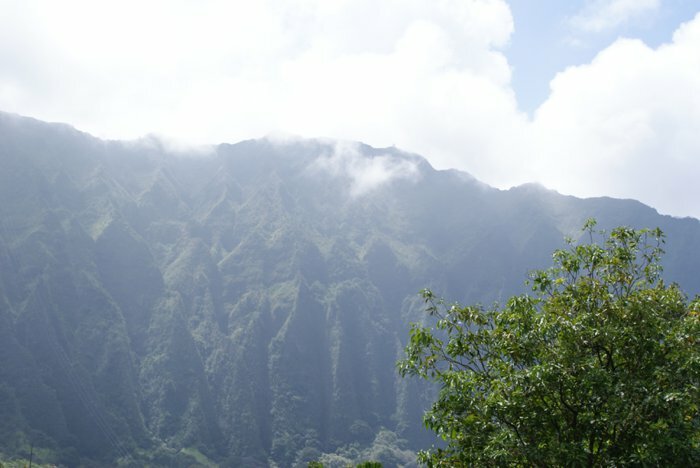 Drive to Nu’uanu Pali where King Kamehameha fought the final battle that united all the islands. The views are spectacular. On a windy day you can actually lay into the wind and it holds you up! 5. Blowhole and Cockaroach Gulch. The blowhole is a natural volcanic rock formation with a hole in it that acts like a geyser when the waves crash upon it. Cockaroach gulch is immediately to the right of the blowhole where the infamous kissing scene if From Here To Eternity was filmed. 6. The Zoo, located at the east end of Waikiki. Not sure if admission is still free but certainly worth visiting. 7. Of course the already mentioned Polynesian Cultural Center. By day you can stroll through “villages” representing Hawai’i, Tahiti, Samoa, Maori, just to name a few. By night, the most spectacular Polynesian revue with song and dances of all of Polynesia. 8. Also already mentioned, Pearl Harbor Memorial. Very sobering and humbling as you read the list of names engraved on a great marble wall, and seeing oil still leaking from the ship. 9. Fisherman’s Wharf where you can charter a fishing excursion, Pearl Harbor tour that includes battleship row, embark on a sunset dinner cruise, or enjoy the most incredible bowl of clam chowder at the wharf restaurant. 10. The world’s most famous pink hotel, The Royal Hawaiian. Presidents, Royalty, dignitaries, celebrities have all stayed at this wonderful hotel. Well, that all I could think of off the top of my head. As far as eateries, must have malasadas from Leonard’s Bakery, manapua from the manapua factory in Kalihi, teriyaki from Zippy’s Drive-in (plenty delicious teriyaki steak, 2 scoop sticky rice, 2 scoop macaroni salad, and also famous for their chili), kalua pig, laulau, chicken long rice, lomi salmon, haupia, and poi from The Poi Bowl at Ala Moana Shopping Center, fabulous ribs at Tony Roma’s in Waikiki, just to name a few. 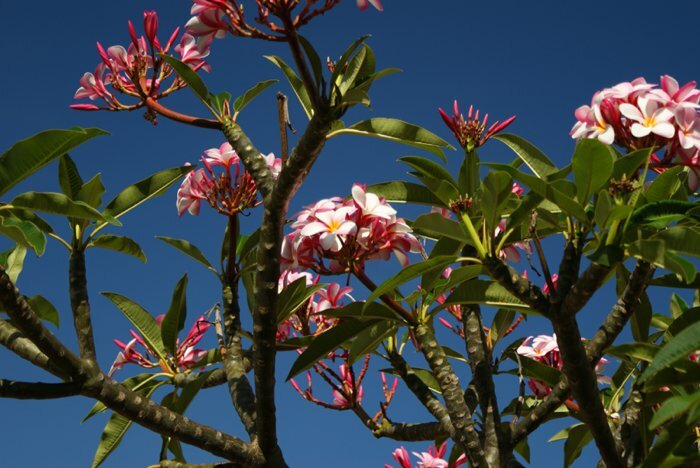 As you explore, notice the abundance of plumeria, crown flowers, orchids, gardenias, bougainvillea, and ti leaves. 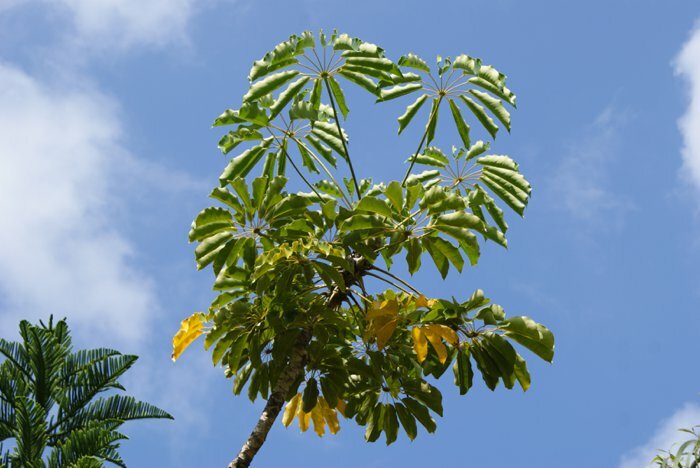 Not to forgot papaya, coconuts, guavas, bananas, mangoes, most growing wild, ripe for the picking, or at the very least simply knock on someone ‘s door and ask permission to pick. If you REALLY want to see O’ahu from a local’s perspective just hop on Da Bus and go around the island that way. You’ll wind through the streets of where they live and take in scenery that you don’t get on a tour bus. Cheaper too! Now I’m incredibly homesick…I’ve transplanted to Virginia, but there’s a saying…you can take the girl out of the island, but you can’t take the island out of the girl! You listed a few things that I didn’t even know about, and a few that I did but wasn’t able to experience. Oh man – I’m sure you’re enjoying your life in Virginia, but I can only imagine that hole the size of the islands in your heart. I only lived on Oahu for less than a year and I can feel it still, 6 years later. Thank you for reading and commenting, and sharing your knowledge here! Great blog post! I’m heading over with friends in October for a short trip (all first-time visitors) and your top 10 list looks pretty exciting! What’s your experience with the weather during that time of year? I’m happy the list got you even more excited for your trip! You’ll have a blast! There are jokes that being a weatherman in Hawaii is the easiest job in the world. “Sunny and 80 for a high, 65 for a low. Chance of rain.” haha! The weather never really gets hotter than mid 80’s and lower than mid 60’s. But because there are lots of different climates on the one island, I’d bring layers. It can be really windy and chilly up on the mountains, and super hot down in Waikiki. It is rainier in the mountains, so a raincoat or something for rain might be a good idea. I always brought a sweater to restaurants etc because the AC is cranked usually. Basically, if you bring clothes for heat, and then bring a couple layers to wear if it gets chilly and/or wet, you’ll probably be set. I was lucky enough to visit Oahu with my friend and we got to stay with her aunt, who was living there at the time. She knew the ins and outs fairly well, so that was a huge advantage! We went on the Admiral’s Tour of Pearl Harbor, which is a private tour guided by members of the Navy, and it’s FREE! And not just for Veterans. But of course as a Veteran, it was very special to me. There was only about 15 of us in the group, so much more personal and quiet than the well-known tourist boats. We did the Swap Meet, which was fun for the first 30 minutes, but then you realize that people are selling pretty much all the same stuff … it was A LOT of walking, but we did pick up some cool loot. My friend’s aunt lived in a gated community right next to Ko’Olina, so we got to walk to the lagoons each day (which was fantastic!) I went snorkeling with Kai Oli Oli and it was amazing. They went out of their way to find the good spots for us, since we weren’t quite in ‘prime’ season for dolphins and whales. They did follow a small pod of dolphins so we could see them up close, which was really neat. Being in Ko’Olina, it was also easy for us to head to the Paradise Cove luau. It was amazing! Great food, great entertainment; can’t say enough nice things! One thing I would recommend is the Macadamia Nut Farm. Sounds kind of cheesy, but it was actually VERY cool! For an extra fee, you get to go on a boat ride with some of the tour guides, who are dressed in grass skirts the whole time. It was very unique and a lot of fun! Thank you for the great comment and added information! I wish I had known about the Admiral’s Tour!! FREE?! That’s such a hidden gem! Aren’t the lagoons amazing? I swear they’re straight out of a movie. I don’t think I have ever heard of the Macadamia Nut Farm, so that’s a great addition! Thank you! There’s something about Hawaii – it doesn’t even matter whether you go there for a week, a year or a decade – it gets into your system instantly and never leaves!! Thank you a lot for the interesting article! I am going to move to Hawaii next month because of my job and I am still learning about this place. For one thing I am sure- this is the heaven on Earth. I am so excited and I can’t wait to go there and to see all of these incredible places! Oh man, lucky you!!! You are going to LOVE living there!!! I think that like living anywhere, when it’s “home”, it can lose some of it’s luster. But if you’re intentional about it and make a point to get out and enjoy the amazing beauty of the island, you will not fall into the trap of becoming complacent and taking it for granted. What a blessing you’ve been given! I hope you’re able to explore all of these things and more! Thank you for the encouraging words Laura! So kind of you! I can’t wait to learn new things about Hawaii! Hi Laura! I found your blog post a few months before we took our recent trip to Oahu, and I’m so glad i did! Between your advice and the comments of your readers, we filled every minute of our ten day trip with fun! I had to come back to say THANK YOU!!! My husband and I took our four kids (ages 16, 15, 13 and 10) on this trip for our 20th anniversary, and there was fun for all ages there! 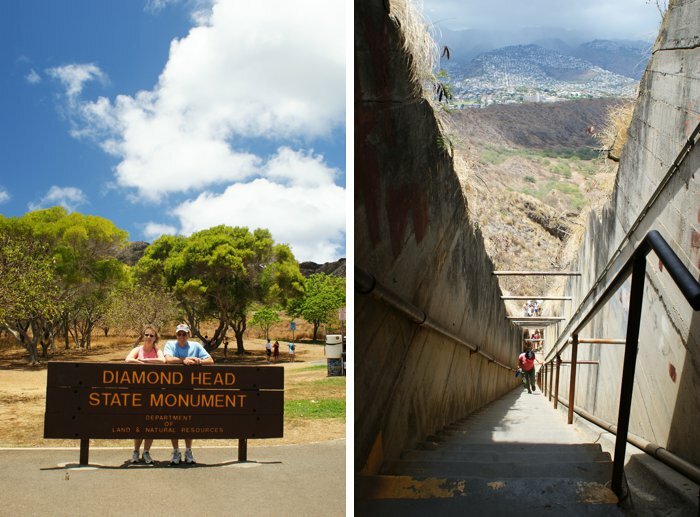 We hiked to the top of Diamond Head crater (although it says it is easy, my daughter and I didn’t hydrate enough early on so we had to take a few breaks toward the top…something to be aware of with kids and adults alike). 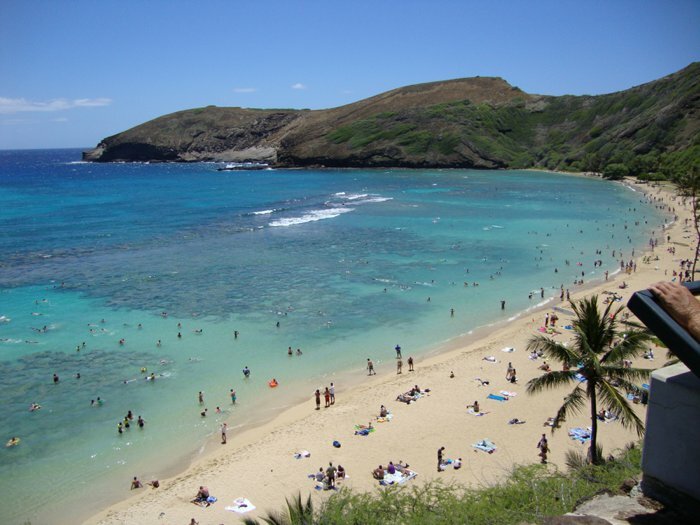 We took surfing lessons at Waikiki Beach and snorkeled at Hanauma Bay. We had rented a house in the marina of Hawaii Kai and drove everywhere we could on the island — even with railway construction, nothing look longer than 90 minutes to get to, even on the other side of the island! 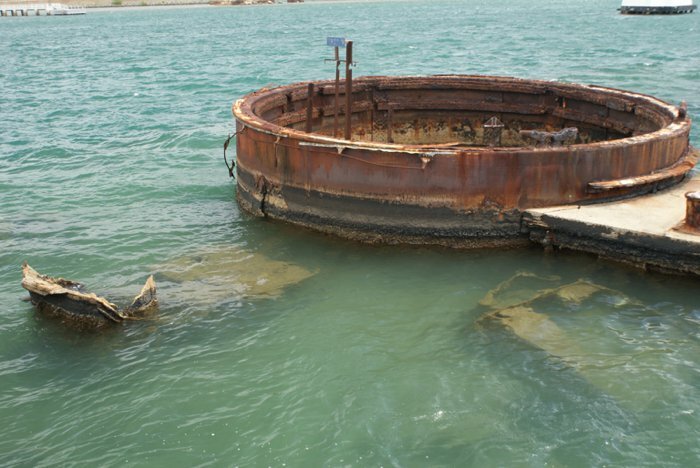 We took the tours at Pearl Harbor (including the U.S.S. Arizona Memorial, the U.S.S. Missouri, and the Pearl Harbor Aviation Museum) and it was an amazing day — what an important history lesson for all of us. We also drove to the North Shore and swam (and jumped off the rocks) at Wiamea Bay. 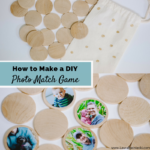 So gorgeous — and so much fun for the kids! While the waves there are usually crazy big in the winter, it was very calm because we were there in July…hardly any waves to speak of. We attended a luau called Chief’s Luau (at the same location as Sea Life Park – it got the best ratings for luaus at Trip Advisor) and it was wonderful! Not too long, fun for kids and adults, and the chief was funny! We also took a morning drive along the coast and stopped at every “scenic overlook” and I’m so glad we did! 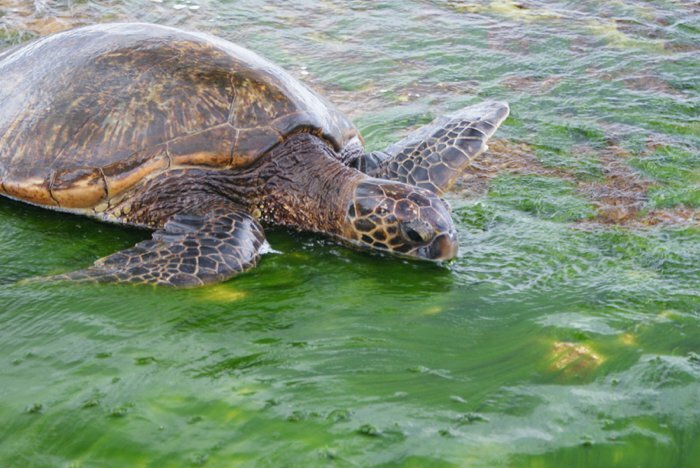 We spotted sea turtles and wild life of all kinds! We saw the Blowhole and Cockaroach Gulch, and got some amazing photographs. We enjoyed walking around Waikiki in the evening to eat and shop and people-watch. We even ate outside at Duke’s — a long wait but the scenery was like out of a movie! On our last day (with time to kill before heading to the airport), we attended the Ukulele Festival in the park next to the zoo and had a great time listening to ukulele bands from around the world as well as Willie K and Jake Shimbakuro — my daughter plays the ukulele so she particularly enjoyed this! (Have you ever heard Jake play? Check him out on YouTube and you will be blown away!) We also took a day trip to the big island to tour the Volcanoes National Park and visited Rainbow Falls. A long day, but worth it! None of us were ready to leave when our ten days were up…we still had so many things we wanted to do and see. Even walking around, I couldn’t get enough of the flowers and trees and birds and wildlife…even the salamanders! I kept stopping as my gang kept on walking so I could take pics…then I’d run to catch up. Eventually they began to stop along with me, and by the end we were pointing out butterflies and flowers we had never seen before to each other. All I can say is Oahu was a little bit of paradise and it was a trip my family will never forget. The kids are already talking about how we can get back there…college? Work? They are thinking about it! They will have to save their pennies since a gallon of milk was almost $8, but I can’t blame them for wanting to go back…I want to go again, too! Thanks again for sharing your knowledge and expertise with us…and thanks to your readers who also added to the information base. It helped us to plan our trip to the fullest and I really appreciate it! THANK YOU for this amazing recap of your trip!!! It literally brought tears to my eyes, because I can not only tell what an amazing time you had, but I can tell that you guys have now been infected by the Aloha spirit that just gets into you the minute you set foot on the island!! Thank you for recapping all that you did – it will be very helpful to people planning their own trips. I had a family friend who’s daughter went to college for a few years on the island – I can’t think of a better place to go to college, really! Yes, it’s expensive, but I think it’s worth the sacrifice to be able to call it home. Warmest aloha to all of you!! I too had the opportunity to attend University on Oahu and I loved it there! The Polynesian Cultural Centre is a definite must and for a few days too. There is so much to see and do there. Hukilau Beach & Goat Island , Ponders Beach, Pipeline, Bikini Beach, Wiamea Gardens, Turtle Bay, Teds Bakery and Pali lookout are a few of the places I would add to a must see list. Thank you for reading and commenting! I appreciate you adding to the list! I went to a few of the places you listed, but a lot of them are new to me, so thank you!! Thank you for your recommendation of the PCC! That’s been mentioned by a few other people so it must be worth checking out! Thanks for the link to the discounts too; that’s super helpful for people making travel plans! Thank you for adding in some great suggestions, Betsy! I don’t know if anyone had mentioned Koalo Ranch before so that’s a great addition! Hi! Thank you all for your input. Going to Hawaii in January with the husband for 2weeks. Excited much! Just reading your posts make me wanna go back there already even if I haven’t set my foot there yet. I believe it’s going to be an amazing trip…. You are going to have the best trip ever!!! What a way to celebrate your 10th wedding anniversary!!! Haha, be prepared to leave with Hawaii deeply embedded in your bones. It doesn’t matter how long you are there, there’s something about it that sticks with you when you leave! What an amazing blog..thank you so much. Should I order any travel books and if so which ones would be good? My husband and I are going in March 2016 to celebrate our 25th anniversary…so exciting! We were also thinking of going for a day trip to Maui…thoughts? Thank you for reading and I’m glad you enjoyed the post!! Oh, you and your husband and are going to have a BLAST on your trip! What a way to celebrate 25 years of marriage! Congratulations! Matt and I took a weekend trip to Maui too. I personally am a small town kind of person, so while I find Waikiki beach and the city parts of Oahu fun, I must prefer the slower paced North Shore of Oahu [like I mentioned in the post]. Maui has a more rural feeling to it, which I just loved. 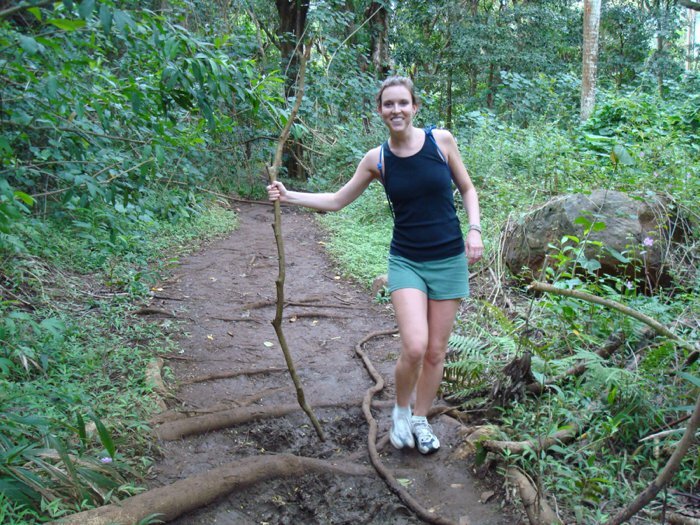 I think that visiting Maui would be a great addition to your trip! I’m not sure how the day-trips work; how much time you’d have to explore etc. We loved the city of Lahaina on Maui – it’s a quaint little tourist town on the ocean and has tons of shopping and eating options. So fun to just walk around. We did the drive to Hana but that’s an all-day trip, so if you just went for one day, you probably wouldn’t have time for that. There is a big volcano/mountain there too that I wish we had done up. But we just ran out of time!! We plan to go back and extensively visit Maui someday! Let me know how your trip goes! I’d love to hear an update afterwards! Great Post Laura. We planned a last minute holiday to Oahu and this is exactly what we were looking for, a brief description, couple of great pictures and some basic information of some of the things to do in Oahu. Well done! Thank you!! I’m glad you found the post helpful and I hope you guys have a fantastic trip to Oahu! Very Helpful Information and Beautiful Photos. Thanks! You are welcome, Jason! I’m glad you found it helpful! Thanks for reading and also for sharing your guide, Matt! You’ve got great tips as well! Mahalo for the feedback Laura, if you’d ever like to guest write an article for us just drop me an email…we’d be happy to get an article from you and link back to your site here. 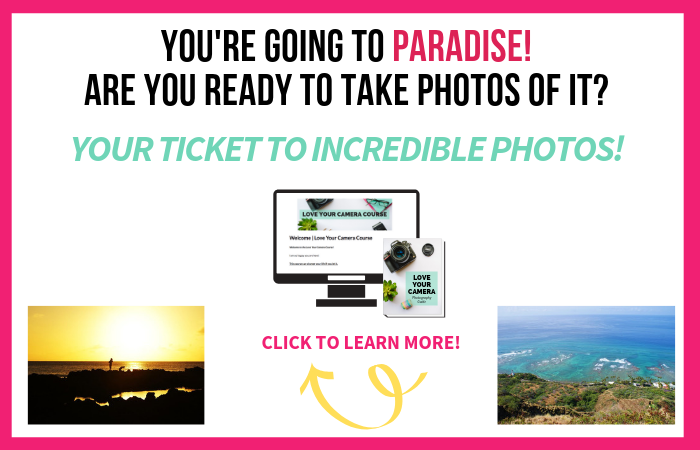 How exciting that you get to go visit Oahu again, and for TWO weeks this time?! You’ll have even more time to explore and without feeling quite so rushed. Yes, it’s hard to know where everything is and how long it takes to get between each one. There’s also traffic to consider etc. You’ll definitely be in a more centralized location this time, with being at Pearl Harbor. Schofield was more inland in the middle of the island, but I remember correctly. Did you ever go by the Access road. Apparently that is only a mile while the first option shown is 10 miles. I wouldn’t want to miss the best parts by taking the shorter option. Is the area around the falls your favorite part of the trail? I was surprised that Wiamea bay didn’t make your short list. Do you think it is too touristy? I’m a plant and garden nut so we will definitely go to the botanical garden you recommended, as well as several more. Since we’ll be staying near the art museum and my wife has several things to do there we will probably have a few half days with time to do things around Honolulu. Any other recommendations for sites to see around town? Oh, you are in for a treat with your long Oahu stay coming up!! I took a look at the Maunawili information you linked to, and to be honest, I can’t exactly remember which path we went on. But I know for sure it wasn’t 10 miles. I’m thinking we did the middle option, the 2.5 mile route. I remember it being a decent hike, but not excruciatingly long [which I would definitely think a 10 mile hike would be way too long and hard for me haha!]. 1 mile sounds too short though, so I’m pretty sure it was the 2.5 mile route. I know we parked in a neighborhood; the trailhead was right off the main road in a neighborhood. I googled Maunawili Falls just now and I’m pretty sure it gave an accurate address for the trailhead we used. It was in a neighborhood in Kailua. I liked the actual Maunawili Falls the best, but the hike in is pretty too. There wasn’t necessarily anything specific about the hike that I loved; just being in the jungle, seeing the vegetation, feeling like you’re truly on a remote Hawaiian island… That was my favorite part. So if you think you’d like to try the 1 mile hike in, I think you’ll have a great experience there too. 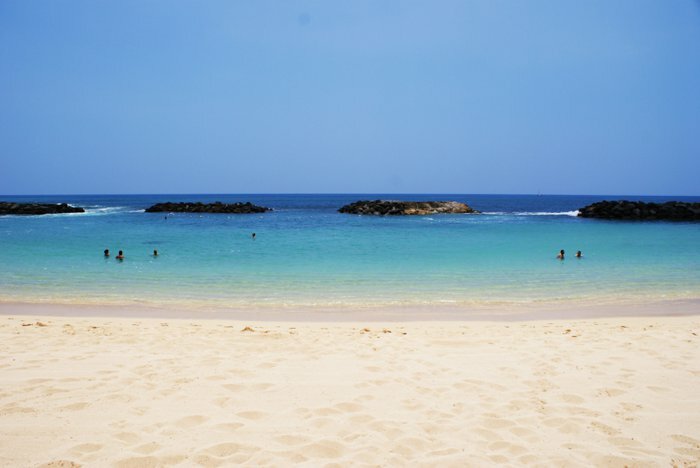 We never stopped at Waimea Bay and went down to the beach, no. The main reason was that the parking lot was always completely full when we would drive by. I didn’t want to jump off the big rock that’s a popular attraction there, so I was ok missing it. I did go to the Waimea botanical gardens [I forget the actual specific name of the place but it’s on the left as you’re driving up to the North Shore and pass the Waimea Bay area] and that was beautiful. If you’re a plant and garden fan, that might be another fun place for you to go. I think it has an entrance fee if I remember right, but it was worth it. When we were in Honolulu/Waikiki, we mostly walked around and looked at different shops and restaurants, as well as went to the beach and Pearl Harbor of course. If you’re lucky enough to be there during one of the times they have a movie or a concert on the beach, that’s a fun thing to go see. There’s also the Honolulu Zoo that is kind of fun. We live in a smaller city in Minnesota, so we don’t get to go to the zoo too often. You will have such a memorable time there! We will be taking a trip to Oahu at the beginning of March 2016. Nine family members. The only person who has been to Hawaii is my Mom for her honeymoon in 1974. We are all very excited to go and will definitely check out the sites you have mentioned! Thanks for the message! I’m glad you found my post and were able to get some tips for your trip! Enjoy and I’d love to hear what the highlights of your trip were! Hi, Laura! My mom and I will be visiting Oahu at the end of May. Since our last family trip to the Big Island in 2012, I lost my dad and my husband. I understand there’s a lantern festival that commemorates loved ones that have passed. Do you know where I can find more information about this service? Thank you! I’m so sorry to hear about the loss of your dad and husband. What a special way to commemmorate both of them on your trip to Oahu with your mom. Good luck finding the details and I wish you all the best on your trip! Hi Laura! Loving this post! Thank you. We are heading to Oahu for a week in August (couple with 3 kids, ages 8-13). Do you have recommendation for hotel or where to stay (city?)? Having a kitchen and nearby grocery store would be ideal. Thanks so much for any help on this. Thanks for the comment! How fun, you are going to love your trip!! You know, I am not sure about lodging as we mostly stayed in cheap hotels or on base before we lived there. I think the Oahu Chamber of Commerce [http://www.cochawaii.org/] might be a good resource to start with? Otherwise, you could also check out AirBnB too if you wanted to go that route. Good luck and enjoy your vacation!! If I might also make a suggestion, my husband and I took our 4 kids last summer and rented a house (through Vacation Rentals By Owner, or VRBO). It was great! We had plenty of room, a washer and dryer, and were able to eat in sometimes, which saved $$! That’s a great suggestion, Judy! If you are looking for more rural and quiet then check out AirBnB places on the north shore. There is a grocery store near Sharks Cove and one in Laie. Turtle Bay resorts also rents out condos and townhouses on their property that then give you access to the pool etc. Thank you for the info, Christina! Great suggestions! Hi Laura, we are thinking about going to Hawai this year in September for one week. Do you thing is enough time to visit the best places around the island? By the way, very usefull and great tips. Yes, I definitely think you’ll be able to see the best of Oahu in a week’s time. Of course, the more time the better – but I’d say a week is probably what most people spend there when vacationing. You can see a couple of the different attractions in the same day, depending on what they are and where they’re located on the island. That should allow you to see or do most of the whole list during your week there, if you want to! The island isn’t all that big, so getting around doesn’t take too long. We’re headed to Oahu this weekend to celebrate our anniversary! 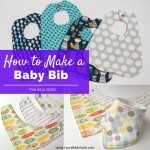 So enjoyed your blog; great tips! Appreciate all the folks commenting as well! I’ll come back & postsome of our favorite activities upon return! I hope you have the best time in Hawaii, and congratulations on your anniversary! I look forward to hearing what some of your favorite activities were! I’ve just stumbled across this website and it’s been a massive help, thank you! We are planning a West Coast trip for 2018 including a week or so in Oahu, where we plan on getting married. We are travelling all the way from sunny England with potentially 15 family members so this will be a huge adventure. I need all the info I can get my hands on!! I’m glad you found the post and the information helpful! Oh wow, you will have the trip of a lifetime! And getting married on Oahu?! I can’t think of a better place for a wedding! Best of luck in your trip planning and I hope you have the best time! You will have a great time in Hawaii! I hope you love it as much as I do! Wow, that is going to be an amazing trip for you and your wife!!! I think that 3 weeks will be enough time for you to visit at least a few of the islands, if not all 4. It will be a busy trip, that is for sure, but doable. I would choose your top 5 things that you want to do on each island and prioritize your trip around those things, so that you make sure you get to do the things that are most important to you, and also so that you don’t get too tired or burned out in the process. Good luck with your planning and I hope you have the trip of a lifetime! I just got back from my holiday to Hawaii, 4 days in Maui and 6 days in Waikiki. I’m already planning to go back in Feb. Can anyone recommend a good luau in Oahu? One that includes cocktails and the Kalua pig. I know people have mentioned both Germaine’s Luau and one at the Polynesian Cultural Center. I can’t speak from experience from either of them, but I would guess both would be similar and both great. I think both would definitely offer cocktails and Kalua pig since that is such a luau staple. If you want to know more, you could always contact the Oahu Chamber of Commerce and ask them if there are any other favorites besides those two. Good luck finding one! If you find one you love, I’d love to know about it so I can pass it on to others! I’m glad you found the information helpful and loved exploring the island!! Thanks for the info Laura. My wife and I will be visiting the Hawaiian islands for the first time. We’ll be doing 5 days in Maui and 5 days in Oahu. Really looking forward to getting away from NJ and enjoying the tropics of Hawaii. You are welcome! Thanks for reading and I’m glad you enjoyed the post! Thanks for the nice tips. You may want to add: the Pillbox mountain hike in Lanikai which was quite a challenge, but the view from the top was amazing and hike to Manoa Fallls. Thanks for the additional tips to add to the list! This article is really helpful to me. I planned to trip next holiday on Oahu, Hawaii . Thanks for sharing. You are welcome, Suraj! Thanks for reading and happy travels! Great list! Personal recommendation, make sure you hike Makapu’u Point Lighthouse Trail, and visit Turtle Beach, the Honu (green sea turtles) are awesome! Need lodging close to some of these awesome locations? Check out the Moana Blu Collection. A group of luxury vacation rentals around Oahu that offer a truly luxurious window to beachfront Hawaiian living! Please, take a look. This is a good list! 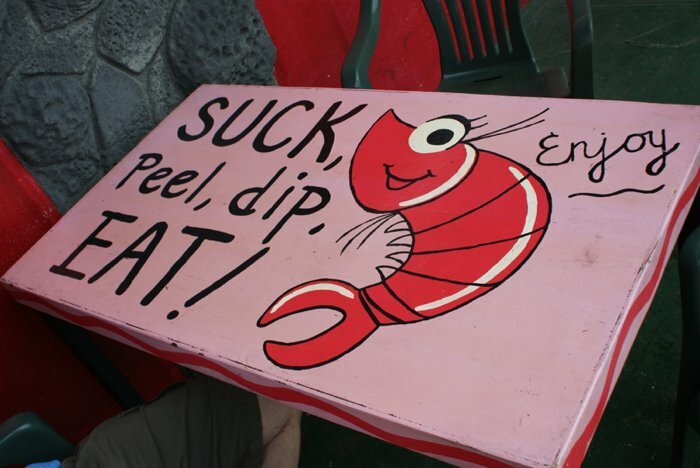 This guide really directs you on what and how to enjoy in Hawaii. everyone who wants to visit Hawaii should read this. Thank you for sharing and nice photos you got here! I will be going on a cruise around hawaian islands in Sept. 2017 (for our 25th Wedding Anniversary) and finishing off by spending 3 days in Honolulu. We will be staying in a Waikiki hotel by the Beach. I was wondering if you can suggest some restaurants not too cheap but not too pricy as well. Any suggestions? Hi Sylvie! Congratulations on your upcoming Hawaiian adventure! You are in for the experience of a lifetime!! You know, it’s been awhile since we lived on Oahu, and even when we did, our usual favorites were more on the Cheesecake Factory realm haha! (23 year olds will tend to eat like that, I suppose haha!) So unfortunately, I don’t have too many recommendations for you as far as restaurants go. My husband’s favorite was a bar called The Shorebird. It served food too, but they loved the ambiance. It was right on the beach. I do know that the guidebook I bought (and linked to here: http://www.amazon.com/gp/product/0983888787/ref=as_li_qf_sp_asin_il_tl?ie=UTF8&camp=1789&creative=9325&creativeASIN=0983888787&linkCode=as2&tag=lauraradni-20&linkId=MTN2DDAEFTNRKQ7R) was SUPER helpful and included a lot of dining recommendations. You might also get some good tips from your hotel front desk too? Sorry for not being of more help. I hope you have a spectacular trip! 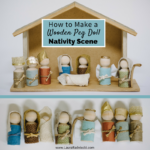 Loved this blog. Very useful information. My husband & I are going to Hawaii for a week next May on the way home from New Zealand. Husband wants to go to Pearl Harbour but finding it really confusing as to which island to stay on. Also I have read somewhere about all the crime, locals leaving their cars unlocked to save damage when they are broken in to and it’s not safe to go to the beach at night. Any comments from anyone who’s been there recently. Hi Jan! Thanks for reading the post; I’m glad you found it helpful! Wow, what an amazing trip you have coming up!! I do remember hearing about the crime. I think it’s always somewhat of a concern, but things like making sure any valuables are locked in the trunk of your rental or taking them with you will help a lot. I wouldn’t go to the beach at night, no. Watching the sunset is one thing, but once it’s dark, I wouldn’t want to be in the ocean anyway haha, so I would probably steer clear of beaches after dark. There is definitely crime, but I think that normal common sense carefulness goes a lot way to keep you safe. As far as which island to go to, Pearl Harbor is on Oahu, so if that’s the main thing your husband wants to see, I think Oahu would be a good bet for you guys. Although, with your trip to Hawaii being a week long, you could definitely do a few days on Oahu and a few days on another island. Depending on the other activities and attractions you’d like to do or see, I think Oahu might be the best fit for you guys this trip. I hope that helps! Maybe some of the other people who commented will chime in with more current into about the crime. Best of luck with your plans and I hope you have the trip of a lifetime!!! It is going to be a trip of a lifetime as we have a couple of days in Singapore on the way out and a good few months doing South & North Islands in New Zealand, so we want to get our Hawaiian trip right. What we heard about the crime really frightened me. This part of the holiday is basically to chill and enjoy the beauty of Hawaii. We are in our 60s so will be taking things a bit easy after a lot of driving around NZ. It doesn’t seem as though hiring a car is a problem though as long as we take normal, sensible precautions. Thanks again and I look forward to what other peolle may say. Thank you for the wonderful ideas. My fiance and I are getting married in April with the Honeymoon in Hawaii. We will be staying on Oahu and already planning different things to see and or do while there. Gonna add your tips to the list. Hi Jennifer! You are so welcome! 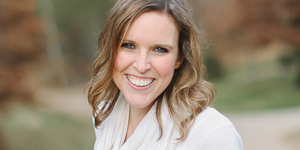 I’m happy you found my post and have added these tips to your list! You’re going to have a truly memorable honeymoon! Enjoy it!! Turtle Beach is a well known holiday destination of the world where a lot of visitors visited it annually and spent their holidays. I really like it so much and have a spent spectacular time there. I would love to go there again if I get any chance. Laura, this is a great list! I’m a Oahu photographer and those are some of my favorite places to shoot family sessions. 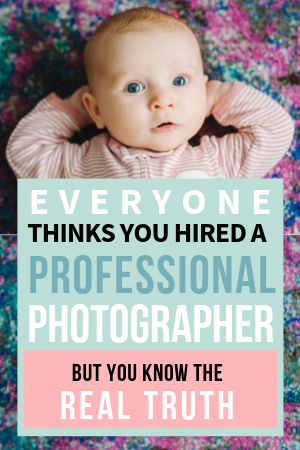 I’m going to share this with my clients! We did a top 10 of our fave things to do so far…it’s done through the eyes of our 10 year old son. Thanks again for the post! Hi Hana! Thanks for the link to the video done through the eyes of your 10 year old son. How fun!! And so lucky to be able to visit Oahu so often!! Enjoy!! 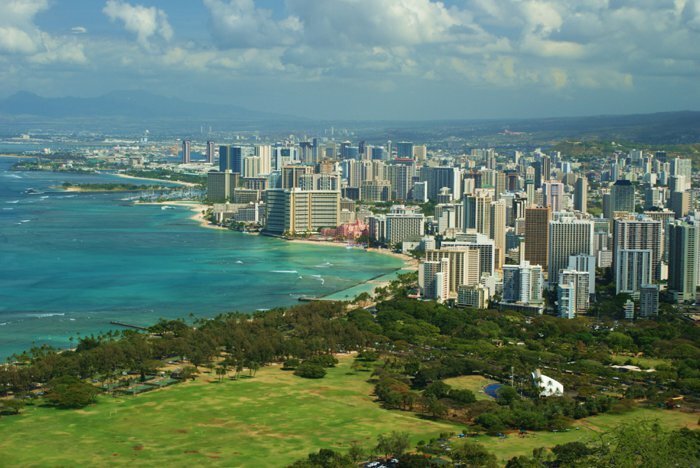 Oahu is a well known holiday destination of the world where a lot of visitors visited it annually with family and kids and enjoyed their holidays. I really like it so much and have a spent spectacular time there. I would love to explore this most exciting destination in my future life again and again. Laura, I have a question about Diamond Head. My husband and I are planning an early 50th anniversary at Oahu next month. We are 67 and 68 years old and we want to climb Diamond Head but I am wondering if it will be too steep for us with the 225 steps. I already know to take plenty of water for the hike. Thanks for writing and asking your question about Diamond Head! And congratulations on your Oahu anniversary trip plans! You are going to have a wonderful time!!! Take everything I say with a grain of salt of course, but I would say that if you are in good shape, you would be fine. You can take the steps as fast or as slow as you want, so that should help. Going when it’s not too terribly hot would help it not be as strenuous too. People of all ages hike it, and I even saw some women wearing high heels on it! Not that I’d recommend that haha – but I don’t think there’s any reason you shouldn’t be able to do the hike if you pace yourself, unless there’s a physical or medical limitation that would make something like that too difficult. Let me know how your trip goes! I hope you have a wonderful time! Hi, we are preparing our trip to Oahu, I am getting nut with the tours. We are going to stay 6 days and we would like to see city and nature. Regarding nature, which tour do you recommend us? We are travelling with 8 years old girl, so LOST TOURS of 8 hours is too much… and tHE KUALOA RANCH of 1 hour is tooo short. 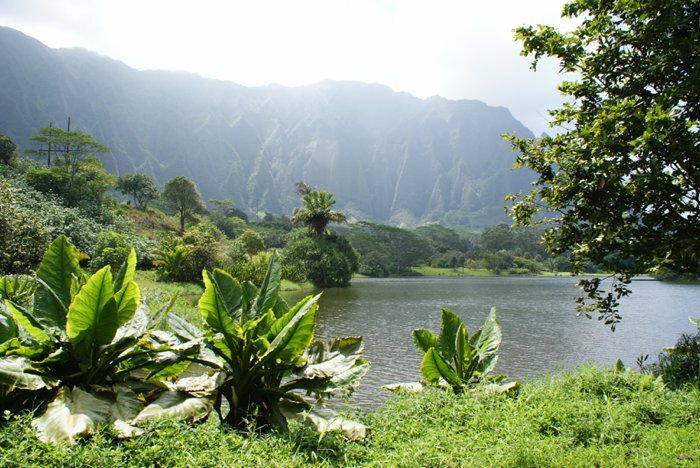 What about the Kuola Ranch package? Thanks for commenting and I’m happy you found my post. 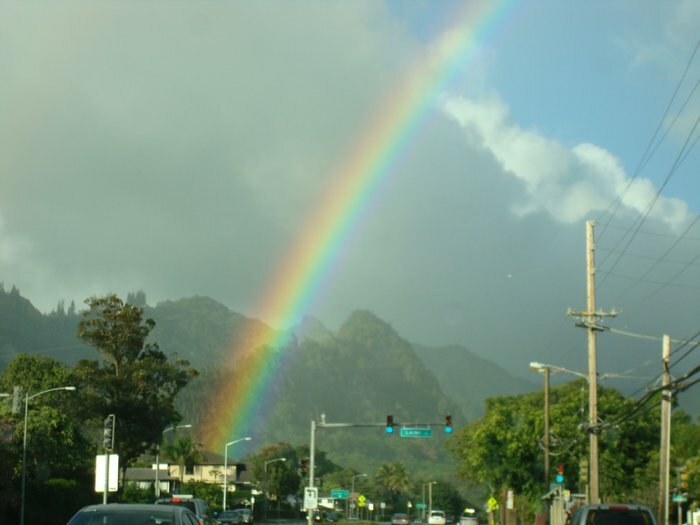 How exciting about your upcoming trip to Oahu! Unfortunately, I don’t have a lot of experience with tours on the island so I’m not of much help there. I would start with contacting the Chamber of Commerce and seeing if they might be of help to you. Also, depending on where you are staying, the front desk staff often are a great resource for help. You could call wherever you are staying and ask for some information or recommendations that way too. Good luck with your preparations and I hope it’s the trip of a lifetime for you! I have just read a post about trips in Oahu. We were there in May and 2 places we would suggest are the Polynesian Cultural Centre and Waimau Valley. We enjoyed both and whilst the Centre isn’t cheap it does provide a great insite into the culture. Waimau is great with walks through the valley and also the chance the swim in the pool by the waterfall. It is totally safe with 2 lifeguards and lifevests compulsory. We are from the UK and these were definitely our highlights. On another note we would urge eveyone to check very carefully what they are getting when they book in Oahu. We took self catering in the north of the island and thought we had booked a 2 bed house. When we got there it turned out to be a lower floor 2 bed apartment in a duplex. We also had a car arranged but were offered an upgrade at a cost of US$40 for the week, turned out we got charged US$40 per day. With the property it wasn’t great and the end came when we found cockroaches living with us. We love nature and wildlife but not when it shares our accommodation. One dispute is settled the other is ongoing. All we can say is check everything twice before you commit and if it is car hire ignore the queue behind you. Read everything line by line!! We wouldn’t go back to Hawaii again following this experience which is a shame as the local people are very friendly and chatty. Thanks for taking the time to leave your feedback, although I’m sorry to hear your experience with Oahu was disappointing! There’s always that risk with travel, and coming into the unknown. I’m sorry you didn’t have the magical experience so many have. Good points on the Polynesian Cultural Center and Waimau Valley. Others may have added them in the comments as well, but your tips can be further incentive for someone to add it to their list! I hope your second dispute can be resolved soon and you can put the disappointing parts of your trip behind you. Perhaps then the good parts will be what you remember the most! I think your list is spot on! I just moved back to Oahu and am making sure I do as much as possible on this beautiful island before heading back to the mainland eventually. My husband and I went to Oahu 2 years ago for our 20th anniversary, and the moment I stepped off the plane I was in heaven!! We live in Idaho and it is constantly cold here so to go to a place that is warm all the time was wonderful. I can’t describe how different the air smells there in Hawaii I loved it every time we would step outside I had to just sit and breathe it in for a min. My husband and I were there for a week and it was a very full week, our 1st day we decided to walk Waikiki beach and go to the Zoo just for your information if you don’t have a car the bus system is a life saver. The zoo was awesome full of animals and the friendliest people. The second day we went to Sea Life Park and the King’s Luau both were wonderful but our feet were killing us so we just kind of sat around rather than take in the lighthouse hike I wanted to do in between. I can’t believe how funny the luau was and they even gave me flowers for our anniversary, and did I mention Kind the people of Hawaii are. The next day we went snorkeling to Hanauma Bay it had rained the night before and was overcast when we arrived so was a little chilly, my husband is a big guy so it didn’t bother him but I froze after about an hour, definitely see what the weather is like or rent a wet suit to keep warm but oh the fish we saw were incredible! We even saw the state fish Humuhumunukunukuapua and many many others. The next day we did the Pineapple plantation but they were alternating the fields that year so didn’t actually see any pineapples growing. The train ride was fun but waiting 1 1/2 hours to get on said train was not. We also rode the bus there and whenever we got confused by the switches we would ask a local and they were always very helpful. I also wanted to go to the swap meet at Aloha stadium but of course my husband was hurting at the time so just stayed at the hotel and had some couple time instead. The last day we were there we went on a whale watching tour but were disappointed by only seeing 1 hump going into the water. Overall it was a wonderful time but next time I go I am going with someone who will be able to do hikes and water adventures since my husband has bad feet and knees. In fact I’m going back in January 2019 with 2 of my sisters and we really want to do a kayak ride to the “Mokes” do you happen to have any recommendations on who to go thru to rent them? 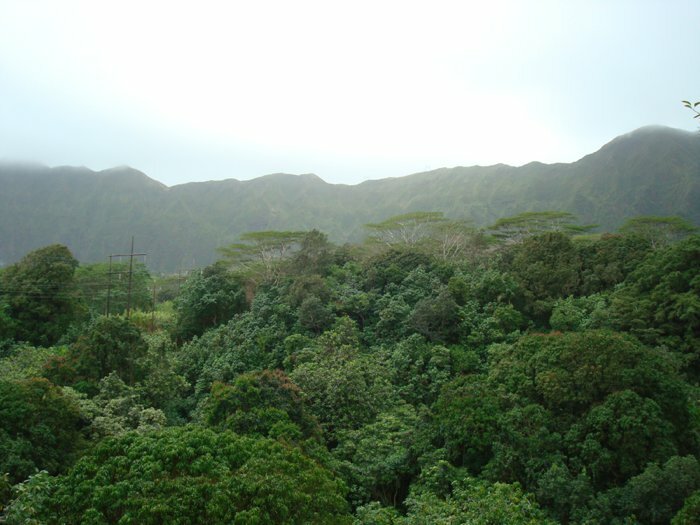 We are also going to go hike Diamond Head, Do the Manoa Waterfall hike, Makapu’u light house, the Kaena Point tide pools, turtle bay, and maybe Lulumahu falls. Still have a few months to plan more. Did you ever try Mike’s Huli Chicken? I’ve heard it is really good, definitely going to try Ted’s Bakery I’ve heard about them a ton. Any other recommendations would be great. Thanks for your blog and all the people that commented they gave me a few more place we will try. 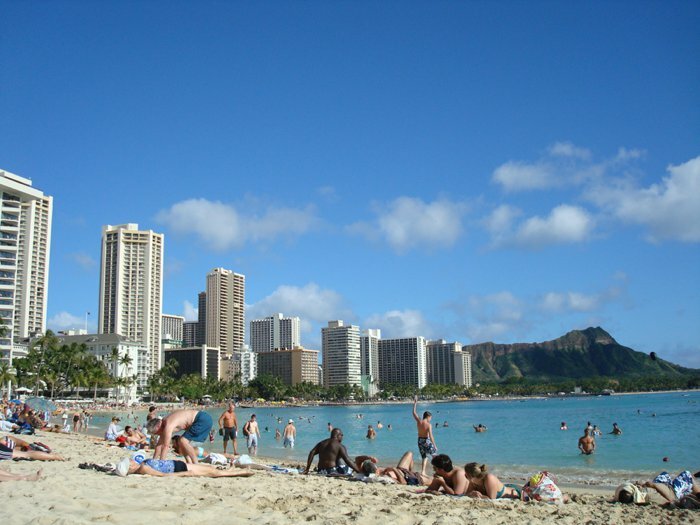 Waikiki Beach is a most exciting holiday destination of the world where I stay for two days. I really enjoyed there boating and kayaking and came back with many pleasant memories. I hope you will have a joyful time there. Hi, Laura! Thank you for sharing this insightful information! We’ve read many posts and watched different videos as I’m planning a trip to Hawaii with my family. After finding your perfect blog post and this video on YouTube https://www.youtube.com/watch?v=NPn22xhM7-c we’re ready for our trip. I like to see a place what I’m reading about so it’s my perfect combination) Thanks! You are welcome, Alena! I hope you have the trip of a lifetime! Thank you for this! I did get a used copy of the book Oahu Revealed and have earmarked it extensively. My sister and I lived in Ewa Beach in our early teen years (1965-68). We’re taking our husbands for 8 days in November and are so excited we can hardly stand it. Some of your recommendations are already on our list and we’ll be adding a couple of others. Aloooooooha!